Adopting a kitten or puppy into your family is both exciting and challenging. One of the first things you should do, once you have adopted a pet, is to bring them to a veterinarian. Our doctors and staff can help make sure that your new addition is happy and healthy. Together, we can cater a plan to ensure your puppy or kitten gets off to a great start! 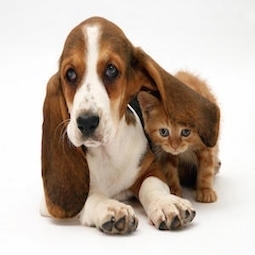 Initial puppy and kitten exams help answer many questions, including those regarding vaccinations, parasite treatment and prevention, nutrition, or behavioral counseling. We look forward to seeing your adorable kitten or puppy soon!